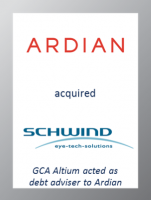 GCA Altium acted as debt adviser to Ardian on the acquisition of a majority stake in SCHWIND eye-tech-solutions GmbH & Co. KG, a leading specialist in laser systems that treats refractive errors and corneal diseases. The Schwind family, which founded the company in 1958, will retain a significant interest with CEO Rolf Schwind, CFO Erich Grünewald and COO Kurt Geiss all remaining in their current positions. SCHWIND eye-tech-solutions develops, produces and markets a comprehensive product portfolio, including diagnostic tools and state-of-the-art laser systems for the treatment of refractive errors and corneal diseases, as well as the corresponding maintenance and consumables. The company’s products are available in 125 countries worldwide. SCHWIND has its own distribution organization in Germany and other parts of Europe – outside of Europe, the company uses long-term established distribution partners. Over 1,500 SCHWIND laser systems are currently installed around the world. SCHWIND’s customers include refractive surgeons in eye practices, eye clinics, laser centers and university hospitals. With the support of Ardian, the group plans to further expand SCHWIND’s position as a global market leader. SCHWIND aims for sustainable organic growth through investments in the development of its existing laser systems and through expansion of its product range. Furthermore, the company will consider suitable acquisitions to broaden its offering. The transaction is subject to customary closing conditions. Terms of the transaction were not disclosed.